The second night of the Da Nang International Fireworks Festival (DIFF) 2018 took place on the banks of the Han River on May 26, featuring firework displays of the teams from France and the US. Under the theme of “Time”, this second night, held after nearly one month since the opening event on April 30, began with singing and dancing performances by Vietnamese artists and students of the Phan Chau Trinh High School. The show by team Féerie from France combined beautiful melodies and colourful fireworks to arouse the audience’ feelings about friendship and show the connectivity of the French and Vietnamese cultures. Meanwhile, team Atlas PyroVision from the US drew bridges of dreams and aspirations on Da Nang’s night sky with their fireworks. On April 30, teams Da Nang of Viet Nam and Surex Firma Rodzinna of Poland were the first to show their fireworks in the DIFF 2018. The event will continue with fireworks shows of the teams from Italy and Hong Kong (China) on June 2, and Sweden and Portugal on June 9. The two best teams will perform in the finale on June 30. 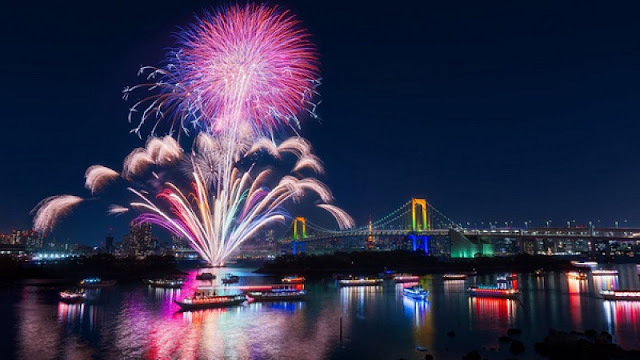 Apart from the festival’s overall theme “The Legend of Bridges”, each of the fireworks nights also takes its own theme, namely Love, Time, Happiness, Desire, and Friendship. The annual event was first held in 2008 and has become a special attraction of Da Nang City.